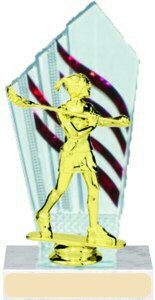 Clear diamondback with color accents gives this trophy, a great looking award for your team or event. Customize your trophy by choosing your base, diamondback color and figure. Gold tone free personalize plate makes this award real special.